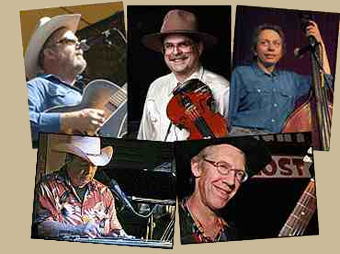 Led by Don, an inductee in the Western Swing Hall of Fame, the outfit also features Steel Guitar Hall-of-Famer Bobby Black, Karen Horner on bass and vocals, and Mark Holzinger on lead guitar, with the irrepressible Paul Shelasky providing fiddling and wisecracks. The show spotlights original tunes from Don's new Western swing album, I Dreamed Count Basie Was a Cowboy, as well as some old favorites from his mighty band Lost Weekend and some other surprises from his vast song bag. Popularized in the country dance halls of Texas and Oklahoma in the 1930s and ‘40s, Western swing music is an infectious combination of old-time country fiddle and cowboy music blended with the rhythmic intensity and improvisational feel of big band swing jazz. This country cousin of urban big band music was brought to the fore by famed bandleaders like Bob Wills and Milton Brown, along with West Coast practitioners of the art, from Tex Williams and Spade Cooley to Asleep at the Wheel and Rhythm on the Range. Don has spent the past decades doing his part to keep the flame alive in bands like Lost Weekend and, now, the Bolos.